So I kind of been going back in forth in my head on Qrystl Frazier designs and whether or not to blog on....really because I have nothing positive to say about it. 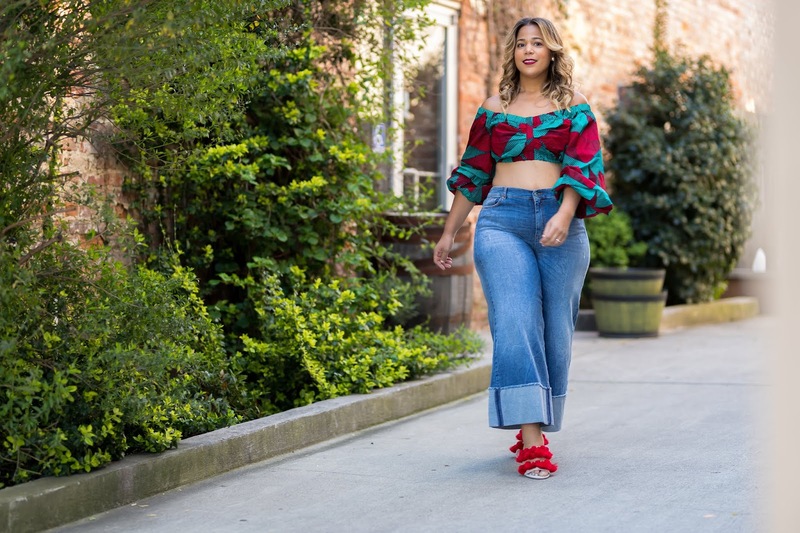 It seems that bloggers have been muting their true opinions on some of these plus size clothes that are substandard in the industry for fear of not being sought out for sponsorship of free clothes, sponsorship, or whatever. I said screw it...I'll do what I want...LOL. I know I am setting my self up for the attack. Qrystl Frazier has been on Rip the Runway for several years and Project Runway. Initially when I saw the line on Rip the Runway...I thought this is kind of cute and I wanted to see how Qrystl Frazier designs would grow. Well, grow is definitely not the word I would use for her clothing. I have seen this clothing line before the designer went to Project Runway and the clothing was poorly made with issues of unfinished seams, strings hanging off the merchandise, and holes in the clothing. Almost 4 years later I saw Qrystl Frazier Designs again at FFF Week and I saw clothing that was not finished, specifically sleeves that were cut and the edges were not finished. The designs did look better. So I guess that is one positive. In addition recently, I have viewed QFD clothing in a boutique with holes in the seams. I was thinking because of this designer's recent appearance on project runway I assumed that the show would have a positively influence the construction and the style aesthetic. Again, I was disappointed. In my opinion, these clothes are definitely not worth the money. Prices start at around $175 to over $400. This dress was actually cute. It was on the runway on FFF Week, but the edge of the sleeves were left unfinished. Even though the dress is cute I cannot see myself paying over $200 for a dress that is not completely finished. Chastity, Thanks for being honest about QFD. I'd looked into getting a few pieces, but no one ever got back to me. I'm a little shocked about the quality issues you've written about: yikes. I think it's challenging, but important, to be critical (in the best sense of the word) of plus size designers and the quality of their clothes because if we aren't, then who will be? I hope that your comments will be seen as constructive and areas that QF could improve upon in her next collection. I really appreciate your honesty and forthrightness. You can even tell from the pictures that these clothes are not well made and definitely not worth $175. Honestly Chastity...I'm wondering what makes you such an expert outside of the fact of being plus size. Fashion is very interpretive!! Though I agree with you in regard to the price, please do realize it takes more material to cover a plus size woman and a profit must be gained somewhere. Also, though the designs are subpar I personally feel the designs will generate some buyers. I've seen several things you have personal suggested or worn and thought to myself "And she thinks she can give advice on what looks good on a plus size woman." But that is my opinion much like this article was yours....sometimes you have to agree to disagree. @FactsvsOpinion - Well if you read the paragraph above the issue is not so much the style aesthetic (b/c style is all about your own interpretation) it is the actual construction of the garment...I think common sense tell us that clothes should be finished (no holes and the edges should be sewn up) On the runway I even saw not only were the edges not sewn up, but the cutting was jagged and I personally know from my own eyes I have seen this collection sold to a boutique like this. As far as what material I think should be used...yes it is an opinion (and if you don't value mine that is up to you and your choice is not to visit my blog and that is your right). I think it is almost common sense that heavier material & non transparent materials work best on the body...generally a more expensive material. I do understand the concern of the designer with plus size bodies and knowing it takes more yardage to cover the plus size body. I feel that some retailers/designers are trying to take advantage of the curvy consumer with high prices and cheap materials to increase their profit margins instead of using that heavier more expensive material. I know because I have researched the cost of different fabric percentages and I know what is substandard, the standard, and high standard fabric. Personally if I see something in another cheap jersey knit I will scream. And again in the article I didn't even mention the material I mention sewing and style aesthetic. 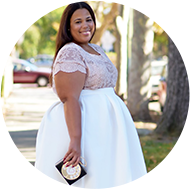 My expertise comes from over 5 years in the plus size business and image consulting business. Again, if you don't like the way I dress or what I have to say it is your choice not to visit my blog and not purchase any of my business services. That is agreeing to disagree. I have heard much hear say about the lack of quality and substandard construction on QFD designs, but I decided not to put hear say I decided to put my first hand experience. As far as attacking my own personal style - I respect your opinion. I would like to add, I wouldn't EVER wear sateen because even with an undergarment; it's bound to show something unsightly... Also, sateen doesn't have much stretch if any at all and "stretch" is definitely my friend! LEAVE Chastity alone, Factsvsopinions... being ugly won't get you anywhere! Aren't blogs one sided by nature? Or any type of review for that matter. A movie critic (which is the same thing as any person that goes to see movies and has an opinion) hates a movie...you love it. That's just the way it goes. They don't have to dig for a positive if they simply didn't like it. Not to overly analyze your response (factvsopinion) but this statement "please do realize it takes more material to cover a plus size woman and a profit must be gained somewhere" is the most out of place line in your response. Of all the plus size blogs this one CONSTANTLY reviews and critiques clothes in all price points....some much higher than QFD. She never said anything about paying more for better quality...as many of her posts are of clothes that many of her readers aren't comfortable buying because of the cost (i.e. all the replies about how expensive everything is). I think it's pretty clear that she understands that higher quality clothes cost more....and she buys and reviews them all the time (Monif C, Kingley & Posh, Kenly Collins Jibri, Rachel Palley,Ladan'sCloset, Ralph Lauren etc) She just said THIS LINE...QFD wasn't constructed for the cost. Maybe you should re-read what she said. With such a high price point, I would assume that the quality of such garments would be superb. Unfinished seams, threads hanging off clothing, HOLES - that is ALL sloppy, and I think taking advantage of plus-size women with extraordinary mark-up. Chastity has always been honest in her posts, and she presents facts along with opinions, and it is clear, that in this instance, it is FACT. I have made 2 purchases from QFD, one for myself and one for a client, my dress, a sequin one shouldered dress for NYE was received in excellent condition and endured much in that one wear, but my client's was not up to par at all due to the reasons that Chastity stated. I enjoy the style aesthetic of many of her pieces and I really like Qristyl as a person. Despite that, I definitely see where Chastity is coming from. Due to the high price point the construction should be be top notch--always. Even if both of my experiences had been great, who am I to question Chastity's review? That commenter is entitled to their opinion as well, but people need to learn how to express their views without throwing darts. This is far from Chastity's first blog post, so if you don't like her point of view, why do you visit? Why visit someone's FASHION and STYLE blog if you don't respect their fashion sense and style? I don't have that kind of free time...lucky you if you do. Also, the quality of Torrid's clothing, which are at a much lower price point than QFD, used to be HORRIBLE...after people started talking about it, things changed. Open and honest dialogue creates change people. @Naja...oooh I like your post on sequins....I LOVE SEQUINS!!! I deleted this comment b/c I thought it was a bit immature. Sometimes when people feel attacked they want to lash out and attack people personally....but I want everyone's comment to be heard. I thank you for an honest review of this product. I as well, feel that at that price point, the construction of a garment should be excellent. I think what needs to be addressed here as well (as you pointed out) is the kind of 'I'll review the clothing and say it's great so that I get free stuff' mentality of a lot of fashion (not just plus sized) bloggers. I think it's great that bloggers get items for free to review, but I also think that the amazing thing about blogs is that they are 'personal' and they're more like a 'conversation' between the blogger and yourself (unlike a magazine). That's one of the reasons I love your book so much is because it feels like talking to my best friend about clothing. Keep doing YOU Chastity, I think you're great, stylish, and most of all APPROACHABLE. I don't care for what is shown here but I have liked SOME of her pieces in the past. As for the unfinished hems, this seems to be a new trend. I've gotten things from Swak like this and just the other day a dress arrived form ASOS that had it. It not my favorite detail of mine and as you say it just feels unfinished. As plus size women, we need better quality clothes to compliment us and she really isn't it! These pieces make me sad! I think it's so interesting that Fact vs Opinion has obviously visited the site on more than one occasion so why come back if she doesn't value the blog author's opinions or selections? Hmmmmm, sounds like the case of the green eyed monster to me. Just by visiting the site she knows that Chastity is an author and image consultant and has expertise in the area so why is she questioning what makes her an expert? Blogs and fashion are in fact subjective and free choice is available to all of us, if you don't like the blog, don't patronize it. I didn't even read all of the review initially and just by scanning the photos the fabric used looked like poor quality. But if you want to purchase the line you have every right to do that as well, Chastity was given her opinion as an EXPERT in the field. Thanks Chastity and keep doing what you're doing! I came by to check for updates on this QFD situation and just realized we have the same background, did you just change it or have I never noticed?! Great minds! Hi Chastity, I totally agree with your article about Qrystl Frazier Designs. I first want thank you for even commenting. We are plus size yes but that doesnt mean we need to accept what is made for us because of our curves. I am a new plus size designer myself. "Christine Dionne Couture" and I started to scope out fellow plus size designers. I was sadly disappointed with the quality and style of clothing from Qrystl. I just felt with the scarsity of plus size clothing that she would take more time and pride in what is made especially with her name on it. I almost felt like plus size women were being targeted because the quality was so poor and the prices were so high. I cherish and admire all plus size designers because of the obstacles we have to go through in proving our stake in this fashion world but we are not here to be taken advantage of either. We need to stick together and standup for quality, style, and reasonable pricing. Don't get me wrong if it is couture then pay for couture if it is clearly not couture(and you will know) then fair market prices please. Thank you for your feedback from a designer's perspective. I think in the end the designer should want to put out an grade A product. it still looks like student work just bad.